Full road going hot dip galvanised chassis to EU regulations. Lights and signals standard fitting. 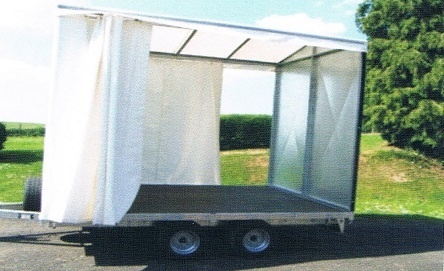 With side canopy as a service trailer. Special sizes available, built to order. Full road going models available. Twin axel 4 pallet model shown, other sizes to order. 175 x 13 road wheels. Low maintenance hot dipped galvanised chassis.